Mid-1800s, elm, Shanxi. Gilded paintings with designs favored by elite class; superb condition; original lock-plate; no restoration. 47.5″ w, 22.75″ d, 71″ h.
Shanxi is known for having some of the best quality furniture made in China and many good pieces escaped damage from wars and revolutions because Shanxi is situated behind the Great Wall and so protected by it. 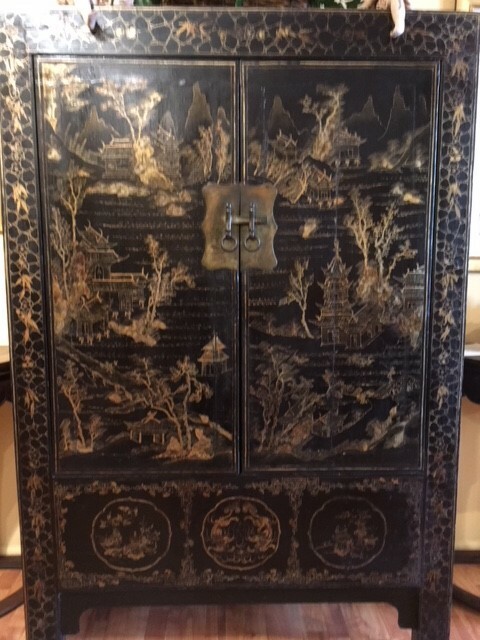 This big cabinet with thick black lacquer and gilded paintings was most likely made for someone of high status during Emperor Qianlong period. On this cabinet, the pair of doors is arranged like a set of matching screen paintings, with each door showing a continuous gilded landscape scene with distant rocky precipices, mansions, pagodas, and bridges set among lush gardens. The bottom panel is divided into three sections with each showing a medallion with gilded paintings. The middle medallion shows two dragons chasing a jewel while the medallions on each side show the “Hundred Antiquities” motifs, all symbolic designs favored by the elite class of the time. The edge around this panel has the lotus flowers and leafage motifs. The surrounding framework in front has gilded paintings of scattered leaves and flowers. All these gilded paintings are protected by a blending of clear lacquer and tung-oil, the reason why the paintings are so well-preserved. The thick lacquer underneath, however, shows some thin cracks at places. Thick layering of lacquer is labor intensive and costly, but it also means the layer is more susceptible to cracking with age. The interior of this cabinet is fitted with a shelf with two drawers. The gilded panels below the pair of doors hide an extended storage space behind. The brass lock-plate and door-pulls are original but the brass drawer-pulls inside might not be. The recessed side panels of the cabinet have supporting cross bars on the outside. An authentic antique cabinet so well-built, so beautifully decorated and in such good condition is very hard to find in the market place today. It can be compared to the chinoiserie style that was the rave of Europe in the 18th century and is still popular today but quite highly priced if the piece is authentic and in good condition.